Training for the Cub Scout program has changed in terms of accessibility. 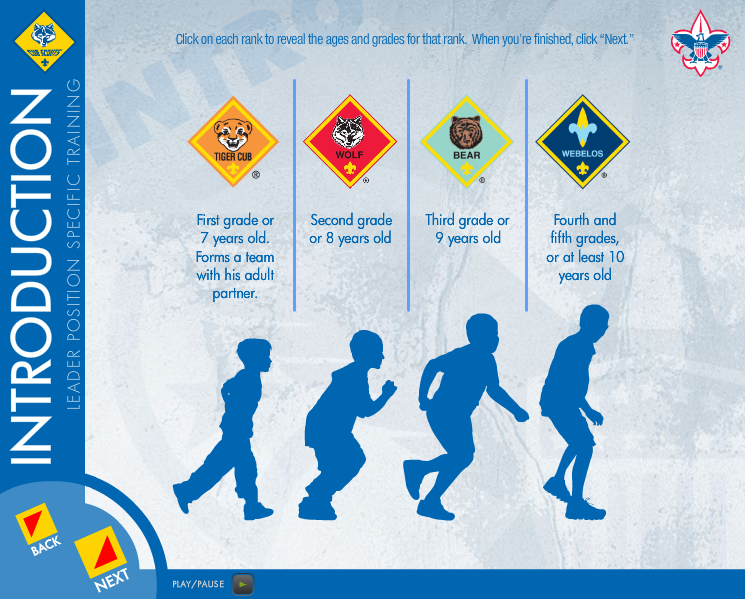 Starting this month (September) all Cub Scout Position Specific training is NOW AVAILABLE ONLINE!!! Each track will have 15 minutes of Introduction to Cub Scouting (this will be a repeat for most of you). After the 15 minutes, you will then spend 10-15 minutes on the Position Specific area (e.g. Tiger or Wolf, or Bear, or Webelos etc.). The total online training time is around 30 minutes. To access this, please login to www.Myscouting.org --> Click on Training --> E-Learning --> Cub Scout tab -- Leader Position - Specific Training. So starting this FALL, if you have CHANGED positions (i.e. Tiger to Wolf den leader), you will need to take the Online PS course. You DO NOT need to retake past positions (i.e. PS Tiger Online) if you have already taken, for example, Tiger PS LIVE training last year. This rule holds true for all positions. You only need to take the new online PS course if you are taking on a new position or are brand new to Cub Scouting. Once you have completed the online training, your training records on Myscouting.org is updated. You will be prompted to print out a training card at the end of the course. Please follow the instructions and print the training card and keep that for your records. We will continue to offer LIVE Position Specific Training for all tracks (Tiger, Wolf, Bear, Webelos, Cubmaster, Pack Trainer, and Pack Committee). We have live training sessions on September 18th, October 2nd, and November 8th. You are encouraged to attend LIVE training, if time permits, because it offer more interactive discussions and Q&A verses the online training. At this point, it is your choice - it is VERY important that your leaders are trained (LIVE or Online -- they're BOTH GOOD!!!) You just need to take one OR the other. Den & Pack Meeting Resource Guide - New for 2010-2011. A MUST-READ for all leaders and parents who want to understand the meeting and advancement schedule, and expectations of the new program. Baloo's Bugle - Published monthly by the US Scouting Service Project, it is loaded with tips, games, and skits etc, all surrounding the Core Value of the month. It is issued a month in advance (ie. The September issue covers October's value), allowing ample time for leaders to incorporate ideas into planning. This is an invaluable reference for Den and Pack leaders. Smoke Signals - A monthly newsletter from the Council and District, with information of upcoming events and training opportunities. The September issue is now available. Scouting Magazine - Published 5 times a year, covering the coolest and latest news of Scouting. The September/October issue has just come out, and you can read it cover-to-cover online here. CubCast - Not exactly "reading material," these are podcast that you can download or listen online. Each monthly cubcast is divided into 2 parts: one on the Core Value of the following month, another on a timely topic. You should find the Cubcast widget on the right sidebar of our website under the title "Cubcast." Feel free to click around it to see the menus and listen to a couple cubcasts. A couple minutes a month, they are the power boost to keep you on top of the most important topic at the time! The long-awaited Position-Specific Training is now available online. That means all four required trainings for Cub Leaders can now be taken at the comfort of your own home. Go to MyScouting.org, log in, and click on "E-Learning" on the left navigation bar. Take the online courses soon to make sure you're fully prepared to lead your den or pack this fall. "Cub Scouts 2010" are predefined recipes for how to conduct Tiger, Wolf, Bear, and Webelos den meetings. These predefined programs are designed to make running den and pack meetings easier because all advancement requirements are already factored into your agenda. All you have to do is assign names and execute the plan!!! 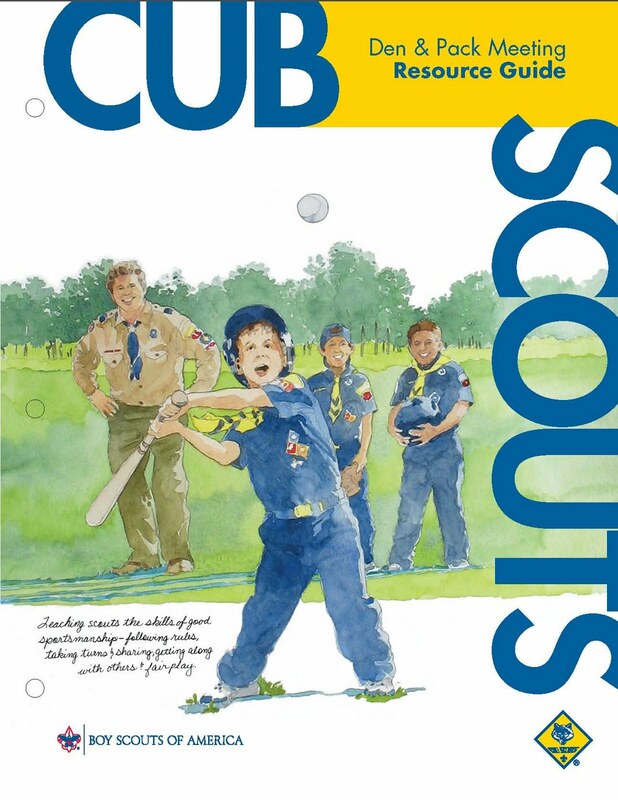 "Cub Scouts 2010" also has new delivery examples and method for Cub Scout Roundtable. These new methods incorporate all the 12 core values in an easy to follow format for each round table month. Meridian district will be holding an introduction training on how to use the new Cub Scouts 2010 program. This training is optional but highly encouraged for anyone interested. Find more details in this registration flyer, and contact district training chair Ray Chan at 925-548-6179 if you have any questions about the training. We mentioned changes will be coming to Cub Scouting in the next school year, and now the new Den and Packing Meeting resource guide is available online for download and purchase. If you are like me who can't wait to read more about it, you can find it here. And if this is not enough to curb your crave, don't miss the 22 webminar sessions on this new program that are already underway! You may have heard about changes in the Cub Scouts program for next year. While things are still being rolled out gradually, here's an overview of the upcoming changes.